Only 2.5 percent of India watched @BeingSalmanKhan's #BajrangiBhaijaan, but what is the reason? Salman Khan's Bajrangi Bhaijaan which released on Eid this year is one of India's biggest blockbusters till date. The film which went on to rake in around Rs 320 crore at the India Box Office, was watched by 3, 54, 87,000 people across the country. While our total population is close to 130 crore, a mere 2.5 per cent of India has watched Salman Khan's Bajrangi Bhaijaan. Another interesting fact to be noted is that the Kabir Khan directorial is the most watched film of this century after Sunny Deol's 2001 Blockbuster, Gadar, which was watched by 5, 05, 73, 000 people across the country. The difference in viewership between two of the most watched films of the century is 1.50 crore which clearly gives an insight into the fall in the number of people visiting the theatres in India. Is it because of lack of good content? We doubt it. Today, when tickets in premium multiplexes in India cost over Rs 350, watching a film on big screen would become a costly affair for an average middle class family. The single screen culture, which was at its peak in the early 2000's has receeded, thus leading to an increase in the average ticket cost across India. The average cost per ticket in India for Gadar was merely Rs 15.80 as against Rs 91.41 in the case of Bajrangi Bhaijaan. Thus, the average cost of ticket at pan India level today is six times more than what it was in 2001. Slowly and steadily, the sky high ticket rates are discouraging the lower class and lower middle class families to visit a theatre to watch a film. The satellite market saw a boom in late 2000's due to which most of the films are now premiered on television within two months of their release. When the film can be viewed for free on television so early, why would a family splurge Rs 1200 to 1500 for a film? Watchable DVD and Pre-DVD rips of 90 per cent of Bollywood films are available online within two days of its release which definitely takes a toll on the number of people visiting the theatres. You never know, if government is able to control the piracy, the world television premiere of most Bollywood films would be delayed by six months or so, thus increasing the shelf life of a film. Though the income from Indian films is increasing, there is a great fall in terms of number of people watching the film in theatres. This is a rather alarming sign and Bollywood needs to wake up and come up with a solution to ensure that more people visit the theatres and give a break to the parties which celebrate the films' entry to the Rs 100 crore or 200 crore club as in reality, the film industry is not progressing. More than the collections which are bound to multiply thanks to the increase in screens and ticket rates, it is about time we judge the success of the films taking into the account the footfalls (number of ticket sold) as the film which sells maximum tickets deserves to be termed as a blockbuster or record grosser. 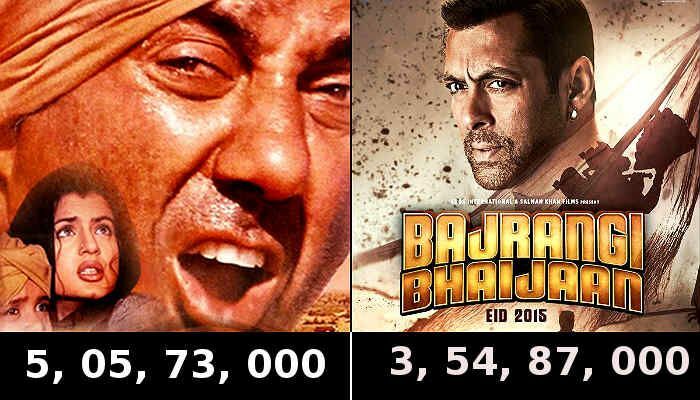 TWEET THIS #Gadar is a bigger Blockbuster than @BeingSalmanKhan's #BajrangiBhaijaan. Find out how: Only 2.5 percent of India watched @BeingSalmanKhan's #BajrangiBhaijaan, but what is the reason?